There’s a brand new presence on Grandview Avenue. 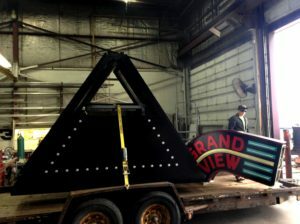 As soon as you crest the hill driving North you can see it, the bright colors in the distance contrasting against the black cabinet of the brand new 1920’s-style Grandview Theater sign. Despite it’s demure size, compared to larger marquee signs of the same milieu, this little beauty packs a visual wallop. 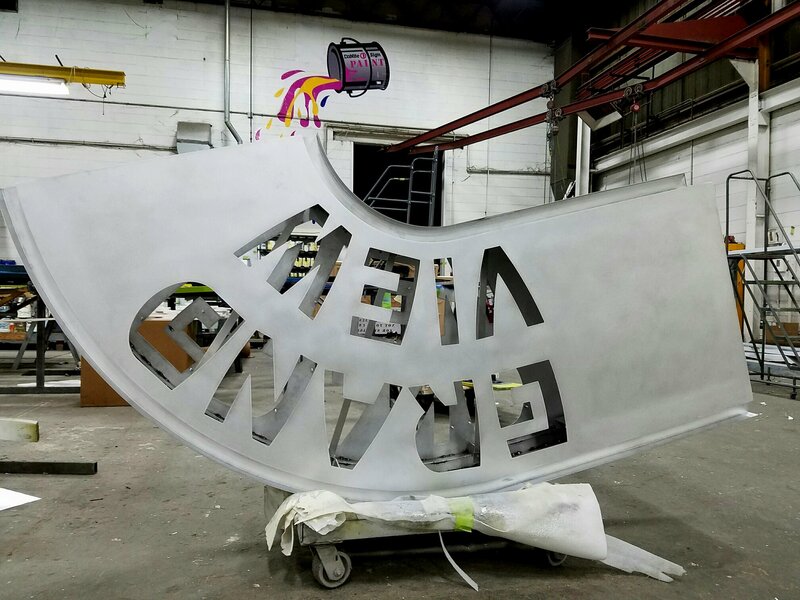 Owner Eric Brembeck has worked with DāNite Sign Company in the past. He upgraded Studio 35’s sign from the externally lit painted plywood that came with his Clintonville theater purchase, to the landmark signage that it is today. 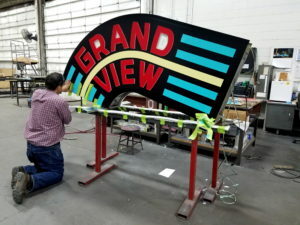 This time around he wanted to give a nod to the Grandview Theater’s rich history with a sign that resembled it’s original projecting marquee. This is exactly the kind of vision and plum project that every sign enthusiast starts to salivate over. DāNite designer Thad King, excited to be involved, digitally traced the old letter font from a picture of the original sign and converted it to vector to keep as true to an historic replication as possible. 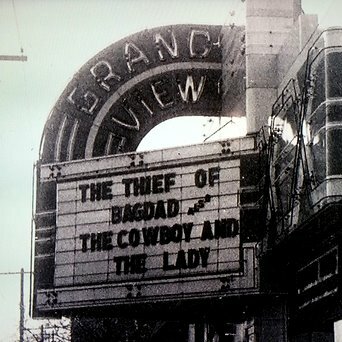 Since pictures were black & white back then, there was no way to know what colors the new sign should be. Executive decisions had to be made. The letters are now of modern fabrication with 1/2″ push-thru acrylic in a routed aluminum cabinet, and the LED border stripes will certainly require less maintenance than did the original neon sign. Even the marquee bulbs beneath the awning are power saving LED. 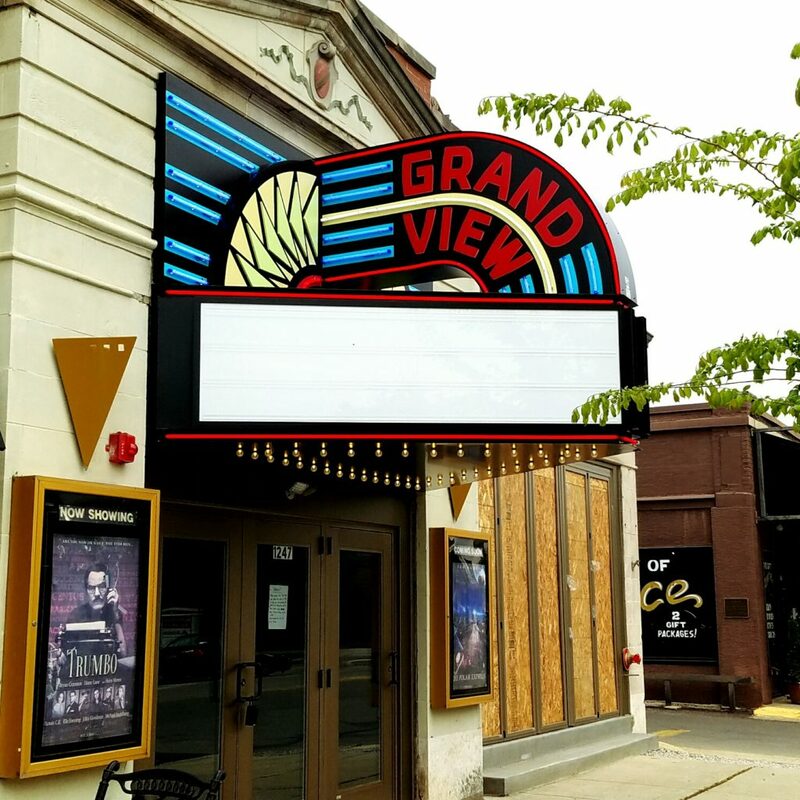 According to the Ohio Exploration Society website, “The Grandview Theater opened in 1926 and is the oldest, purpose-built movie theater still in use in Columbus… possibly even the oldest in Franklin County. 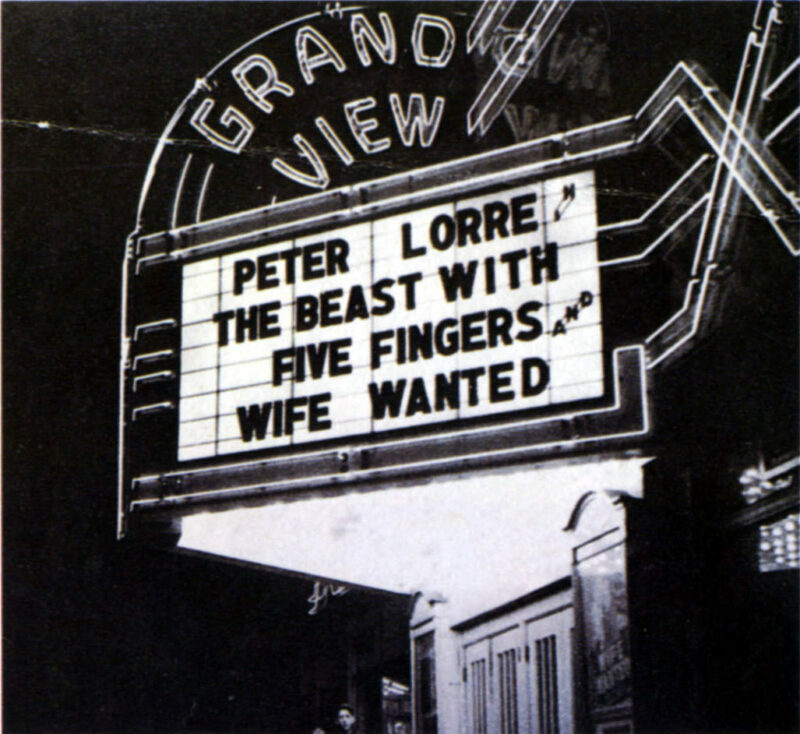 Sometime around 1984, the original marquee was removed from the building. This followed the collapse of a cornice in Columbus, which seriously injured several people, including City Councilman Ben Espy. 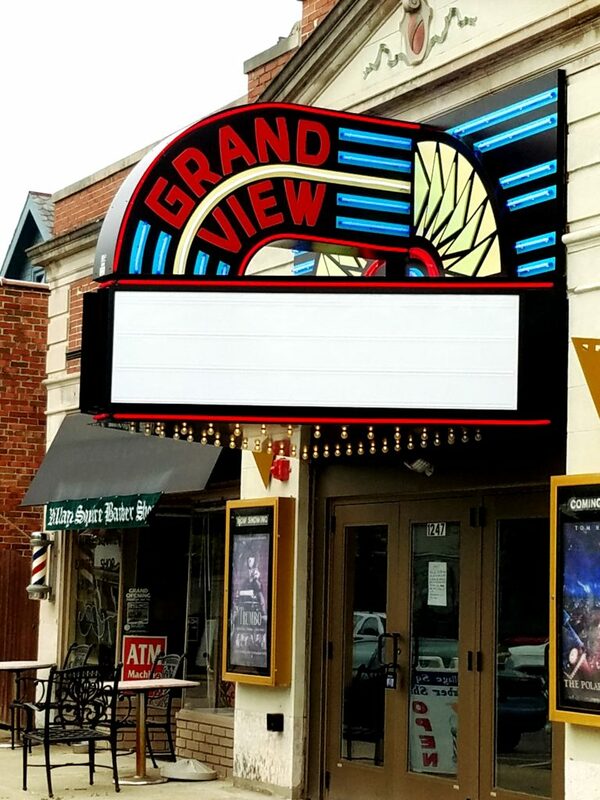 After that incident, a number of buildings had cornices removed and several local theaters had marquees removed.” That would explain why the previous Grandview Theater sign always felt so underwhelming. 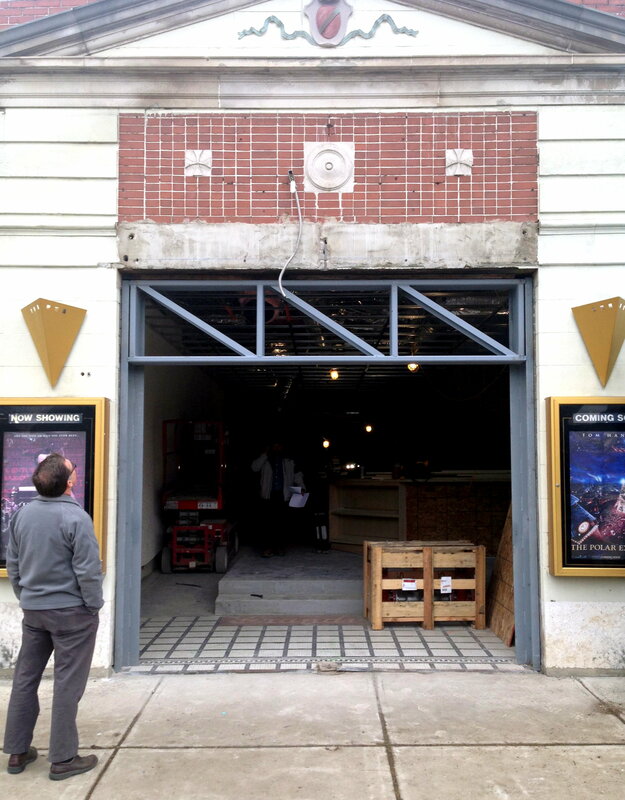 The new aluminum and LED sign, engineered by DāNite’s Michael Cox, Sr., is supported by steel trusses anchored into the old transom space (which also housed the previous marquee cabinet). The sign is much less weighty than the previous projecting iteration. Neon glass tubes, porcelain coated steel, and transformers weighing up to 12 lbs each combine for a much greater load to carry in the older projecting marquees. This sign is light, well supported, and unlikely to injure any current councilmen, or women. It fits neatly on to the front elevation without covering any of the key building details, and it’s impressive without overwhelming the neighboring businesses. In short, it’s the perfect little neighborhood theater sign. 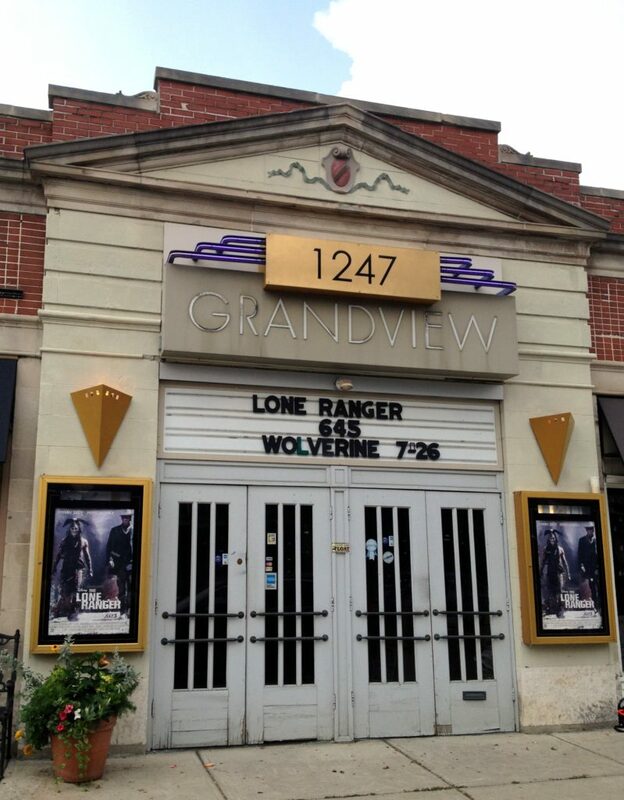 Sign Design Consultant and Project Manager, Jennifer Bender, who saw this sign through inception, design, permitting, and installation, delivered the changeable copy marquee letters Tuesday morning, just in time to populate the marquee rails with the opening film “Captain America: Civil War”. 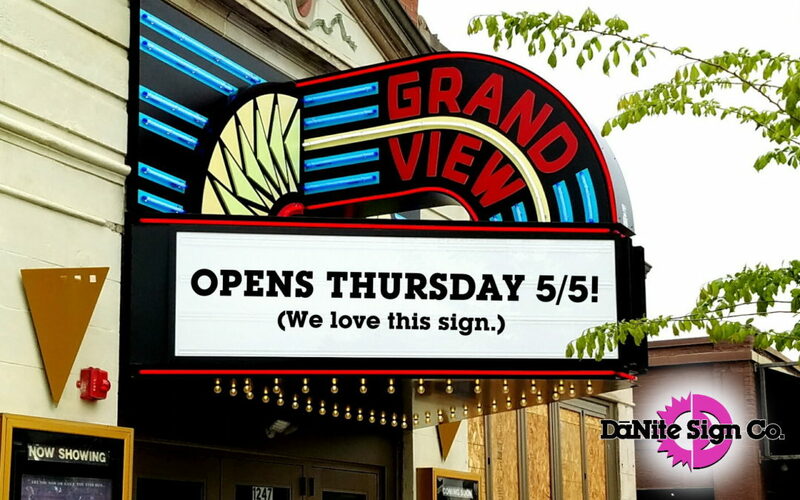 It’s a good bet you will see her there soon, shoveling popcorn into her mouth by the handful and enjoying one of the 40 craft beers on tap. It’s hard to let your baby go out in to the world, but this one will be a lot of fun to visit. 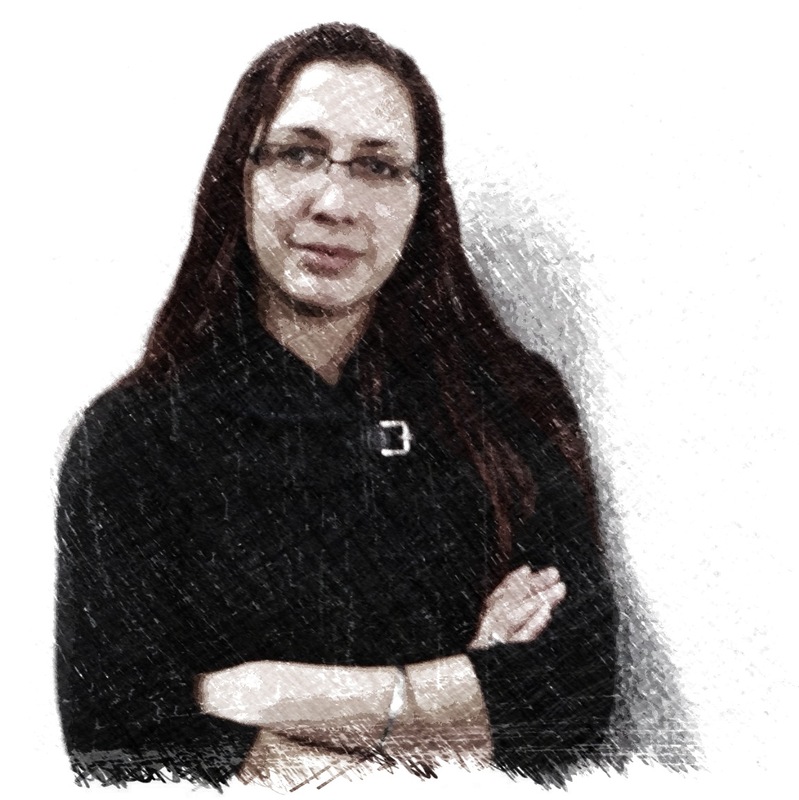 Show times on 5/5/15: 7:00 p.m. & 10:15 p.m.